Barbiere and Mooneyham strike the perfect sense of pulp adventure in this first volume of “Five Ghosts”. “Five Ghosts: The Haunting of Fabian Gray” is a fun adventure yarn that benefits greatly from an original high-concept and an astounding art team. 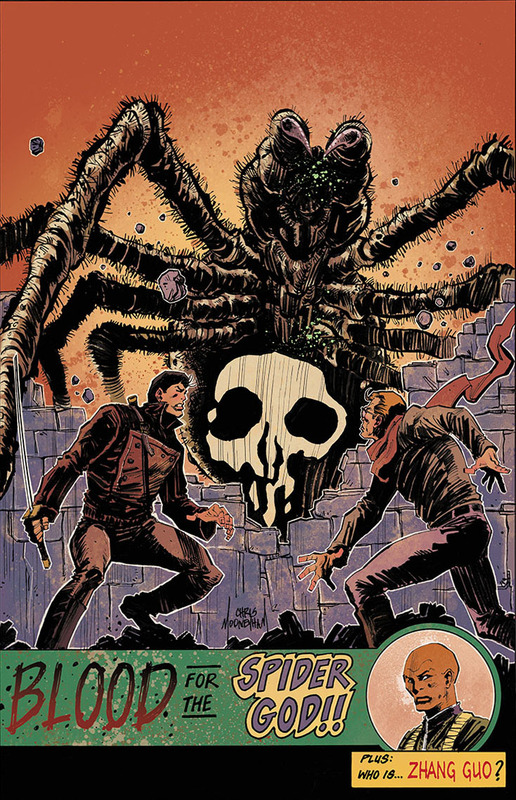 Artist Chris Mooneyham exhibits a strong sense for storytelling and action and writer Frank Barbiere gives the artist plenty of opportunities for both in this introductory volume to this exciting, pulp-influenced period piece. Mooneyham seems to channel Marvel great Sal Buscema, but the artist’s style is nevertheless contemporary. Colorists S.M. Vidaurri and Lauren Affe enliven Mooneyham’s panels; Vidaurri with a simple but bold palette and Affe with a bright, more textured approach. Vidaurri colors the first chapter and Affe handles the remaining four chapters. Barbiere and team introduce us Fabian Gray, a treasure hunter with the unusual power to call upon five powerful spirits who have inspired stories since man first sat around the fire to share tales designed to spark a sense of wonder. Those spirits are a wizard, an archer, a detective, a samurai and a vampire. At any time, Fabian is able to extract the abilities of any of these five beings. This is a useful talent considering that Fabian finds himself leaping from one death-defying adventure to the next. Such powers comes with a price though. The spirits haven’t taken kindly to Fabian’s utilizing their gifts at his whim; Fabian is going to prove that he’s a worthy vessel for these five ghosts. Fabian is also consumed with curing his twin sister Silvia’s current comatose state, a state for which he finds himself responsible. At the same time, Fabian is being pursued by an evil sorcerer named Iago who wants the dreamstone that has been fused with the adventurer and which grants Fabian the ability to exploit the powers of the ghosts. Fabian’s straight-laced friend and colleague Sebastian joins Fabian on a trip to Africa to acquire another precious stone. Thankfully, Barbiere sees no reason to deviate from the structure of a good adventure story and the two men find themselves immediately in mortal danger as spears shoot up towards their rented biplane. The writer relishes the works from which “The Haunting of Fabian Gray” is inspired and Mooneyham has a blast with the material. Each chapter ends with an exciting cliffhanger, and the first few covers, which are thankfully included, promise big action and equally big mystery. Using sparse narration, Mooneyham and Barbiere create a fine introduction to the series and Fabian Gray. Mooneyham capably opens the book, with little text from Barbiere, by perfectly illustrating Fabian’s abilities with small gestures and movements. Barbiere knows that, with the right artist, he doesn’t have to use unnecessary expository narration for readers to comprehend the story and action. Speaking of which, Mooneyham draws terrific action sequences in “The Haunting of Fabian Gray”. The second chapter includes an exceptional plane crash sequence that takes place on a full page, segmented into five smaller panels. The entire page includes a static picture of a hilly terrain and a river below it, but each panel includes separate pieces of the action: the plane descending, the explosion, Fabian and Sebastian leaping to safety, and so on. The character and costume designs in the book are the work of an accomplished artist. As are the stunning set pieces, from the mythical underground lairs and fabled temples to the outlandish flying machine that sails our heroes to safety. Mooneyham has thin, detailed line work that give the book a crisp style. The artist doesn’t include superfluous background details in every panel, choosing to focus on only the necessary elements of the story. Mooneyham’s design for Fabian is also straight out of a pulp adventure from the 1930s, with his dark handsome features and leather aviator jacket. Vidaurri’s colors in the opening chapter are bold, using few shades and subtle textures throughout most of his work. 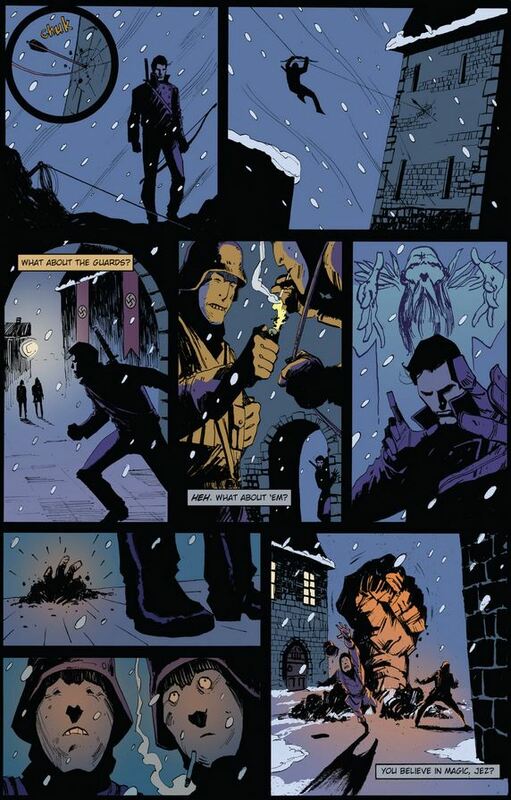 The introductory pages, primarily colored in purple and green-blue hues, are especially striking and keep the storytelling from being muddled by too many effects. Vidaurri employs bright grainy colors in the African sequence which helps illustrate the dryness of the land in which Fabian and Sebastian have found themselves stranded. Affe, on the other hand, keeps the colors bigger-than-life, but she adds more texture and depth to Mooneyham’s pencils. The change in colorists is not jarring and both serve the art impressively well. While not an enormous misstep, the most significant issue of “The Haunting of Fabian Gray” is with Fabian Gray himself. Barbiere hasn’t given the character enough charm to compel readers to care about him and that could eventually hurt the series. Sebastian is an appealing character, always maintaining a gentlemanly composure in the face of all hell breaking loose, but Fabian remains somewhat one note; his storyline too significantly defines him in this first volume. Also, although the villain Iago is absolutely an evil presence in the book, Barbiere doesn’t establish a satisfying acrimonious relationship between hero and villain. “The Haunting of Fabian Gray” is a strong introduction to what can potentially be a fun and exciting long form story. Barbiere uses an affection for pulp tales and added an entirely unique spin with the book’s literary mythical bent. The result is a work that feels simultaneously nostalgic and innovative.